KABUL, Afghanistan (AP) — An overnight bombing and an early morning explosion Monday in southern Afghanistan killed at least 14 people, officials said. The attacks came as the Afghan government announced the country's security forces are prepared for the presidential election next April, although five districts remain gripped by insurgency. 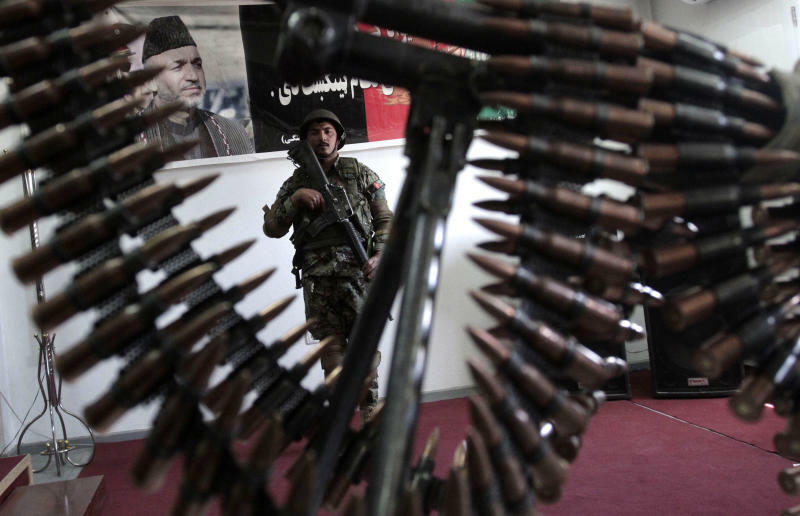 In the east and in the north, government offensives trying to stem insurgent attacks seeking to take advantage of the continuing withdrawal of foreign troops have left up to 96 insurgents dead, the Afghan ministries of defense and interior said Monday. The Afghan army and police took the lead for security around the country last month, as part of a phased drawdown of NATO troops that is to be completed by the end of 2014. But the violence has continued. The deputy governor of Zabul province, Mohammad Jan Rasoulyar, said a bombing late Sunday in the province's Shahjoy district killed 11 people and wounded 12. Three of the dead were local police officers while the rest were women and children, he said, without providing a breakdown for the civilian casualties. The target of the attack was a local police chief who was among the victims, said Rasoulyar. The Monday morning bombing took place in Kandahar province's Spin Boldak district and killed three, a mother and her two children. President Hamid Karzai's office condemned both bombings. The Afghan Defense Ministry said a week-long offensive in the east, which ended Monday, killed 83 insurgents. Three soldiers were also killed in the operation. And in the northern Kunduz province, 13 insurgents were killed, including local Taliban commander Qari Latif, and 29 were captured in an operation there Monday, police spokesman Sayed Sarwar Husseini said. The surge in violence has created worries about the ability of Afghan forces to secure next year's key presidential election, which are to be held on April 5. The vote will be a test of Afghanistan's ability to smoothly transition power ahead of the complete pullout of the international troops. Under the constitution, Karzai cannot seek a third five-year term in office. Interior Ministry spokesman Sediq Sediqi told reporters on Monday that plans have been prepared to secure 6,845 polling centers in all 34 provinces and that the Afghan forces are ready. "With all the capabilities and abilities that we have, we can provide security for the next year election," Sediqi said. He said a plan is also in place to secure more than 400 voter registration centers. Four million new voters are expected to be added to the 16 million previously registered voters. Afghanistan has a population of about 30 million. But Sediqi said authorities still don't have full control of five districts around the country — mainly in the south and the east — because of the insurgency. "We are working on all these five districts over the period of next 10 months to have a complete presence and then election will take place in these districts as well," he added.